Life for the 190SL did not start easy. Not that it was the black sheep in the family, but it was not the white swan either. It was the smaller brother of a show star that had been sent to a gifted cosmetic surgeon to make it look similar. That beauty was just skin deep though, because underneath it did not offer the talent of a thoroughbred, it carried the genes of a reliable, hard working farm horse. 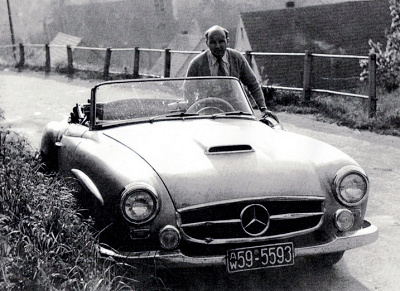 Max Hoffman, famous US importer for Daimler-Benz and other brands in the 1950s, was, as we all know, behind the 300SL. He of course knew his American clientele, so he demanded from the Daimler-Benz board not only the super car for the rich and famous, but also a similar looking beauty for the people who wanted the looks but not necessarily the power. Daimler-Benz, which did not have a presence of any significance in the US, listened to what Mr. Hoffman had to tell them. But the response of board member and head of development Dr. Fritz Nallinger did not really please Hoffman. In a meeting between Hoffman and Daimler-Benz executives in Stuttgart on Sept. 2nd 1953, it was suggested to use the platform of the 180 sedan. When Nallinger showed Hoffman the Daimler-Benz’ concept of a lower priced convertible based on the 180 sedan body, famously short-tempered Hoffman just replied: “Das wird nichts” or “Nothing will come of that”. Naturally he would have been right, had the project pushed through. Something more appealing was needed. 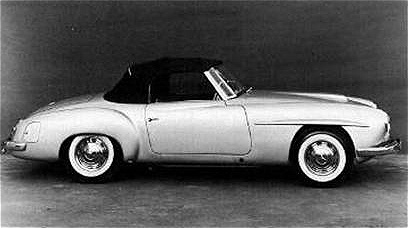 Shorty after that meeting, on Sept. 25th 1953, stylist Walter Häcker showed his boss, head of design Karl Wilfert, first blueprints of what was to become the 190SL prototype. 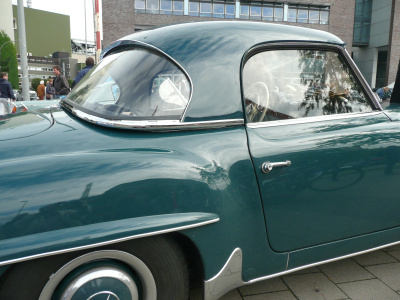 Everybody, including Hoffman, was excited; the car had not only similarities with the 300SL, it carried also design elements of the 180/190 sedan from the rear fenders backwards. After having received the go ahead from his superiors, Häcker achieved something incredible: within only three days he managed to have the final blueprints completed that were needed for the production of the car. Although the car’s concept was basically born due to the insistence of Max Hoffman, he did not have it his way entirely. For cost saving reasons, a number of components such as the chassis and the front axle suspension complete with sub-frame had to be shared with the 180 sedan. This sub-frame was isolated from the chassis with rubber bushings and offered an almost vibration-free ride. A feature that was at that time unheard off in a two-seater open touring car. 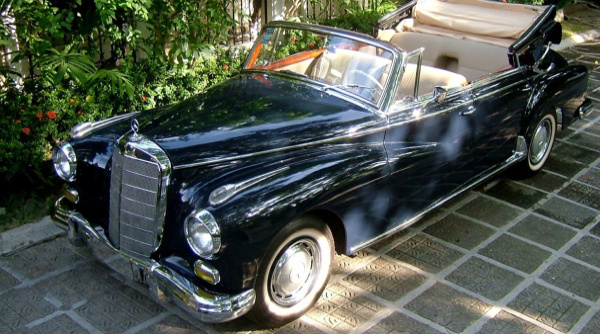 Although 180 sedan and 190SL had similar genes, there were some important differences. The 180 chassis had been shortened by 254 mm (10 in) and the rear axle was not the carry-over from the previous 170S, but instead from the more powerful 220a. That meant it had already the improved single-joint, low-pivot swing axle. Luckily also the idea of upgrading the aged side-valve engine of the 170S/180 never occurred. It was instead a fairly advanced four-cylinder inline version, which was originally developed in its basic concept for the 180. That engine was loosely based on the M186 of the larger 300 sedan. It had a chain-driven overhead camshaft and two Solex 44PHH governor downdraft carburetors. Incidentally the carburetion system was developed by a 27 years old young engineer. 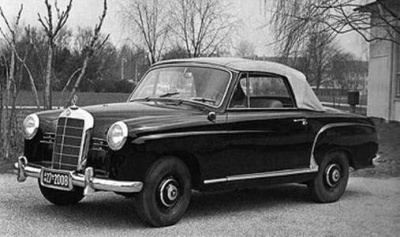 He became later known as the father of the M100 engine for the majestic Mercedes 600. His name is Dr. Kurt Obländer. He also tested the 190SL prototype for its road holding qualities. The new engine was called M121 B II, it had 1,897 cc (116 cu in) and offered 105 hp. Due to its specific noise at low revs it was called half-jokingly by Mercedes engineers “the rattle king”. Although it faced some reservations from other Daimler-Benz departments and even Dr. Nallinger himself, it gave a respectable top speed of 172 km/h (108 mph) and could accelerate the roadster from a standstill to 100 km/h (60 mph) in 14.4 seconds. 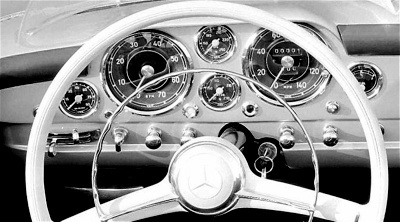 Yet it was widely agreed later among 190SL aficionados that a further 30 to 50 hp would have done the car well. The wheelbase was 2,400 mm (94.5 in), which was identical with the 300SL. Overall length of the car was 4,220 mm (166 in), which was some 300 mm (11.8 in) shorter than its larger brother. Petrol consumption was fairly moderate with an average of 9 liters for 100 km (26 mpg). Also the 65-liter (17 gallons) tank proved to be adequate. Although never officially advertised, the car could be ordered with four different gear ratios: 3.70:1, 3.89:1, 3.90:1 and 4.10:1. The 3.90:1 was the most common one, as it offered the best balance between acceleration and top speed. 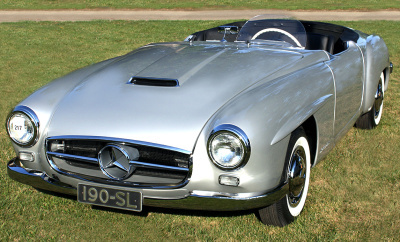 As promised to Hoffman, one of two prototypes of the car was shipped to the New York Auto Show in February 1954 alongside the 300SL. It did not run though and its Solex carburetors were made out of wood. The second prototype did run and was used meanwhile back home for testing purposes. The power output and performance figures published for the New York appearance proved to be on the rather optimistic side. Visitors to the auto show did not know that of course. The public and press admired the 190SL and saw in it an elegant, smaller sports car sibling of the out of this world 300SL. More than a year after its New York introduction, the Mercedes 190SL was finally presented in March 1955 at the Geneva Motor Show. Its base price in Germany was 16,500.- DM ($4,125.-). Its starting price in the U.S. was slightly less than $4000 .-, making it more expensive than the elegant and fast Jaguar XK140. 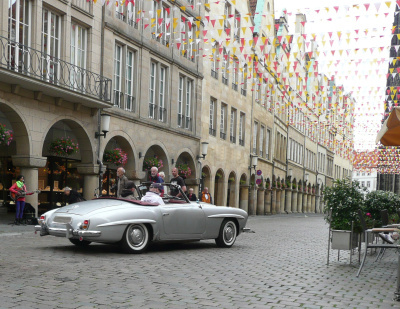 In memory of the Silver Arrows racing cars the 190SL was in its initial year only available in silver metallic. Petrol consumption was fairly moderate with an average of close to 9 liters for 100 km, which equaled some 26 mpg. Also the 65-liter or 17 gallons tank proved to be quite adequate. Although never officially advertised, the Mercedes 190SL could be ordered with four different gear ratios: 3.70:1, 3.89:1, 3.90:1 and 4.10:1. The 3.90:1 was the most common one, as it offered the best balance between acceleration and top speed. 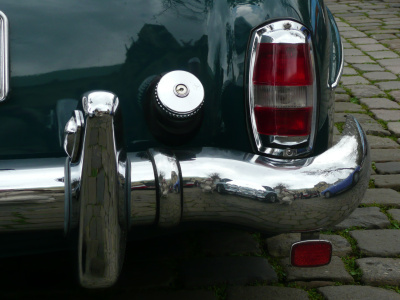 Throughout its career the car had seen minor upgrades, either in form of broader chrome trim at the upper door part in March 1956 or in form of enlarged rear lights in June. 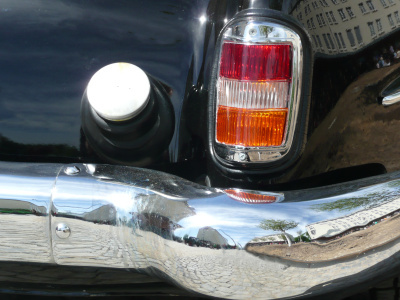 Those lights were now shared with the six-cylinder 220 sedans. 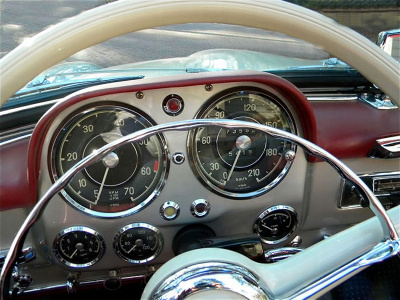 The previously optional clock at the right side of the dashboard became now standard equipment and an ATE Hydrovac brake booster was added. 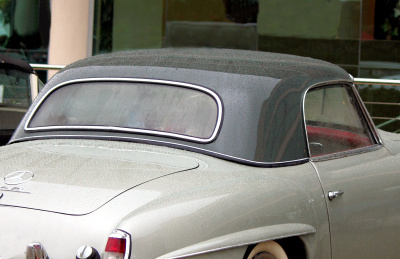 In 1959 the rear window of the hardtop was redesigned, it looked now similar to the one of the 300SL roadster. 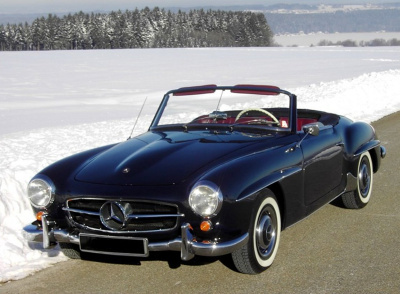 The Mercedes 190SL has always been compared with the more powerful 300SL, but there never really was a need for that. It did not have the muscles of this pure thoroughbred, but its quality and sophistication were almost at par. For some journalists its road holding ability was even better (compared with the Gullwing, not the 300SL Roadster). As already mentioned earlier, there was broad agreement at the time that the car could do with a more powerful engine to match the “S” for sport in the name of the SL. But resources in Stuttgart had been limited to finish this project. The larger engine had to wait for a successor model. If it would have been only for the 300SL, the exercise to build such a vehicle would have been a single one. Sales of the 300SL had been relatively slow and it’s a safe assumption that Daimler-Benz had lost money on every car produced. 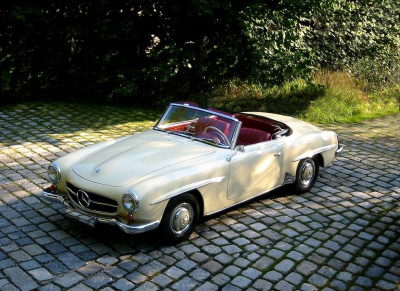 The Mercedes 190SL sold 25,881 units in its career and it was already decided in 1958 to develop a new SL. The “lesser” SL was at the end from a business point of view the more convincing one and aren’t we all glad today to have the option to enjoy such a car. 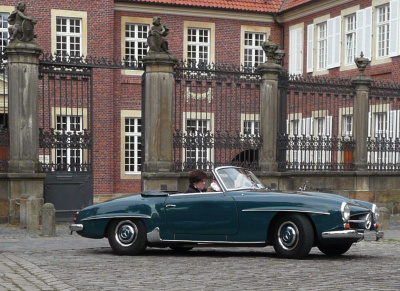 If you want to read much more about the 190SL, here you can buy the book and here the e-book. 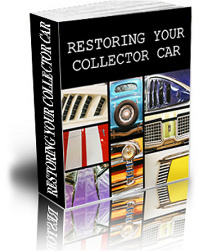 The book does not only cover the 190SL, but also the 300SL Gullwing and Roadster and the Pagoda 230SL-280SL. I am sure, you will enjoy.